Richard Carrión, who has been the face of Popular Inc. for the past 26 years, will step down from his post effective July 1, when he will become Executive Chairman of the Board of Directors of Popular. Ignacio Álvarez — who has been President and Chief Operating Officer since 2014 — who will become the new CEO and a member of the Board of Directors of the corporation, the financial institution added, will succeed him. “The time is right to begin a transition in our leadership structure. I’m ready, Ignacio is ready and the organization is ready for both of us to assume the roles,” Carrión said during a call with investors Tuesday to reveal first quarter results. “As Executive Chairman, I will continue to work with Popular, in collaboration with Ignacio on strategic matters including mergers and acquisitions, innovation and technology, social responsibility initiative and government and client relations,” he said. As President and COO, Álvarez has “demonstrated his strength as a leader delivering positive results in our Puerto Rico business despite challenging conditions and overseeing the repositioning of our operations in the United States, all while showing a deep understanding of our organization’s culture and earning the respect of employees at all levels. He has proven he has the skills, the experience and the vision to lead this organization,” Carrión said. “Leading popular has been the greatest privilege of my life. I’m very proud of everything that we have accomplished. As we are fortunate to be able to continue contributing form a new position, and I have absolute confidence that under Ignacio’s leadership, Popular will continue to achieve great success,” he added. Carrión joined Popular in 1976, became president in 1985, CEO in 1991 and Chairman of the Board in 1993. 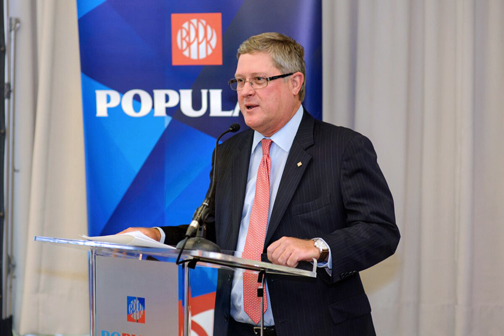 Under his leadership, Popular consolidated its position as the leading financial institution in Puerto Rico, completing important acquisitions such as Banco de Ponce in 1990, Roig Commercial Bank in 1997, Westernbank in 2010 and Doral Bank in 2015. Carrión also spearheaded the transformation of Puerto Rico’s payment system through the deployment of automatic teller machines and point-of-sale terminals during the 1980’s and 1990’s. He led the diversification of the corporation’s revenues, driving significant growth in Popular’s U.S. operation. Meanwhile, Álvarez has overseen the operations of Banco Popular de Puerto Rico and Popular Community Bank for the past three years. Prior to joining Popular in 2010 as Chief Legal Officer, he was a founding partner of a leading San Juan-based law firm, where he specialized in corporate and banking law. “I undertake this new role with a deep sense of responsibility, grateful to be able to count on Richard’s continuing guidance and on the support of an outstanding management team. I am excited about the opportunity to work with our close to 8,000 employees to continue serving our clients and position our organization for the future. 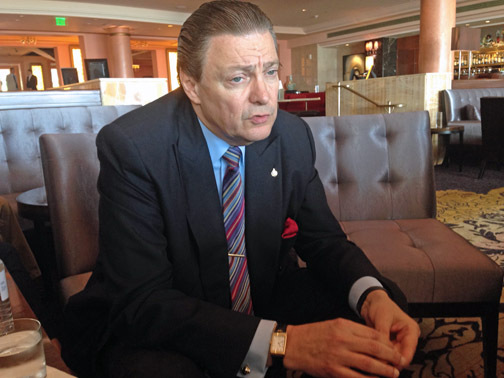 I am energized by the opportunities that lie ahead,” Álvarez said. Ignacio Álvarez, president of Popular Inc. The executive re-shuffling at Puerto Rico’s largest bank was coupled with first quarter results that showed net income of $92.9 million for the period, compared to net loss of $4.1 million for the quarter ended Dec. 31, 2016. The results for the fourth quarter of 2016 reflect an after-tax charge amounting to $87 million, related to the unfavorable award under the portfolio sales arbitration with the Federal Deposit Insurance Corp., as receiver, Popular Inc. said. During the quarter ended March 31, 2017, the corporation completed the previously announced common stock repurchase plan of $75 million, acquiring 1,847,372 shares at a price of $40.60. The plan was completed under a privately negotiated accelerated share repurchase (ASR) transaction. The financial institution recognized $79.5 million in treasury stock, based on the stock’s spot price, offset by a $4.5 million adjustment to capital surplus resulting from the decline in the corporation’s stock price during the term of the ASR. Net interest income for the quarter ended March 31, 2017 was $362.1 million, compared to $355.4 million for the previous quarter. “However, given current imbalances, the plan includes a reduction of government spending which in the short-term would negatively impact economic activity on the island,” he predicted, adding what is ahead for Puerto Rico are “albeit painful” but a step in the right direction to restore the fiscal health of the Puerto Rico government and ultimately the Puerto Rico economy. However, Popular Inc. does not plan for meaningful economic growth in the near term, “we’re hopeful over time for the prospect of a manageable debt load, balance covering the budget and reviewed economic growth,” he said. Hey Buddy!, I found this information for you: "Carrión to step down as Popular CEO after 26-year run". Here is the website link: https://newsismybusiness.com/carrion-popular-after/. Thank you.